You Got Screwed! Why Wall Street Tanked and How You Can Prosper. James J. Cramer. Simon & Schuster. Neil Rogers calls it "The Gambling Channel." If you watch cable network CNBC for any length of time, you're treated to an endless parade of gurus, experts, pundits, scholars and shills touting their stock picks and/or pumping up their own companies' shares. James Cramer, one of CNBC's resident hawkers, was a tireless cheerleader for the bubble that burst along with the irrationally exuberant stock market. His exhortations and enthusiasm was part and parcel of the channel's ceaseless promotion of "investment" and speculation. 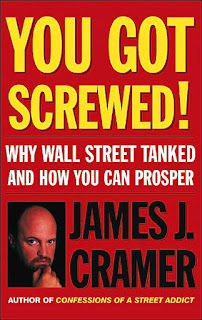 But now, like the contrite convict who finds religion on Death Row, Cramer is a born-again acolyte of skepticism, caution and prudence. He has even published a thin (128 pages) and overpriced ($29) book to spread this new-found gospel. He writes: "Is there a soul on the planet who didn't suffer from the multiple brainwashings that the media, the academics, the brokerage houses, and the mutual funds mercilessly beat into our heads for a decade? Amazingly, after trillions were lost, we still have no regrets, no apologies, nary a mea culpa from those who heartlessly led us to the financial slaughter that outranks even those of the nightmare generations 1973-1974, and, alas, 1929-1934 — that's right, the Great Depression. "These one-note charlatans would, even after every penny of life savings had been lost, still recite their bogus mantras meant to take our eyes off the ball, and our wallets, even as they suffered not a penny for their admonitions. They haven't learned a thing about the havoc they have wrought. They are still out there shilling their wares, except now they are saying that the stock market is even more undervalued than before. "Dow 36,000? You better hope they've perfected cryogenics by then. That's the only way you will live to see it." Wow! Strong stuff! Plenty of righteous indignation! Unfortunately, coming from Cramer, not much credibility, either. Truth to tell, much of his hard hitting criticism should be aimed at himself. He goes on to catalog the litany of transgressions by well-known corporate sinners, such as WorldCom, Enron, Tyco and the rest. But Cramer's just preaching to the choir here; there are no new visions or revelations among this regurgitation of recent and all-too-familiar news stories. The final section of this extended booklet consists of more of Cramer's estimable wisdom. The self-styled guru magnanimously comes up with a bunch of (gasp!) suggestions for avoiding investment traps and, like nearly half the books published during the last few months, problems with 401(k) and other retirement plans, and a whole slew of suggestions for government watchdogs and gatekeepers. Totally hubris-free, Cramer offers a unique service to clueless or indecisive investors among his readers; if they don't know what to do in the market, they can just replicate his investment moves! He even provides the address of his website for that purpose. What a guy! Sad thing, though; this character probably has sufficient name recognition to attract a following and, presumably, sell books. What's next? "Survival Tips For Chickens" by Colonel Harlan Sanders?